Geography/Culture: America, North: Cuba, America, South: Brazil, originally Africa (Yoruba, Nigeria). Linguistic Note: The Cuban pronunciation may be more accurately E*M*NY*, or YAM*NY*. Description: Goddess of the sea; Compassionate Answerer of prayers; Whose waters salve the wounded spirit. Invocations, Pleas, Hymns and Other Homage to HER: Iamanja. To Whom Sacred: flowers (to which prayers have been wispered); toy-boats (on which the prayed-to-flowers are laid and sent out to sea); floating fires (part of the ceremony). Festival: eve of the Northern (summer) solstice. She is identified with Greek Seirenes, Entanglers. She was originally Yemoja, ----, below. Source: Stone AMWv1 96; Funk & Wagnall SDFML 1190. (see also BW.YSN 111, 107, 88, 90. Geography/Culture: Nigeria: Yoruba. Her shrines are adorned with carved figures givin as votive offering by Her worshippers. 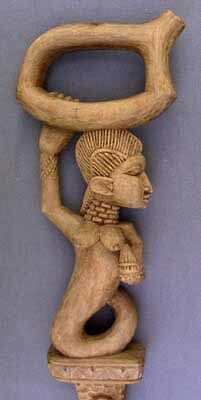 Description: Long breasted White Goddess of the Ogun River; some say She was a seller of meat; others that She dyed cloth and shelled melon seeds. To Whom Sacred: pots (which She had with Her when She fled from Her second consort); river-worn stones (through which sacrifices are made to Her); set of 16 cowrie shells (which Her worhsippers use in divination). In Her shrine is a pot from which water is given to newborn children and to wormen who come to beg Her for children. Her insignia: a string of small glass beads, crystal clear "like water", worn around the neck. Her favorite food: mashed corn; yam loaf; yam porridge; goats; hens; ducks; fish. Taboos: dogs (a dog who eats any part of a sacrifice to Her will die); okra leaves; two other stew leaves. She fights: with those who offend Her by causing stomach ache, or by carrying them away in a river. Male Associate: consort Oranmiyan, King of Oyo; son Shango; second consort Okere, Chief of the town Shaki. Knocked down by Okere She became the Ogun river (because of this act successors tothe title Okere must cover their faces when they cross the Ogun). .
She stole the long straight hair of Oshun, ----. Perhaps variant Yemo, ----, below. worked on: October 1995; October 1994; August 1991; July 1990.